The Hemswell Cemetery is situated on Hemswell Lane. The Cemetery is managed by the Hemswell Parish Council. You can also perform a more selective search for churches in the Hemswell area or see them printed on a map. The church was restored in 1858. The church seats about 220. 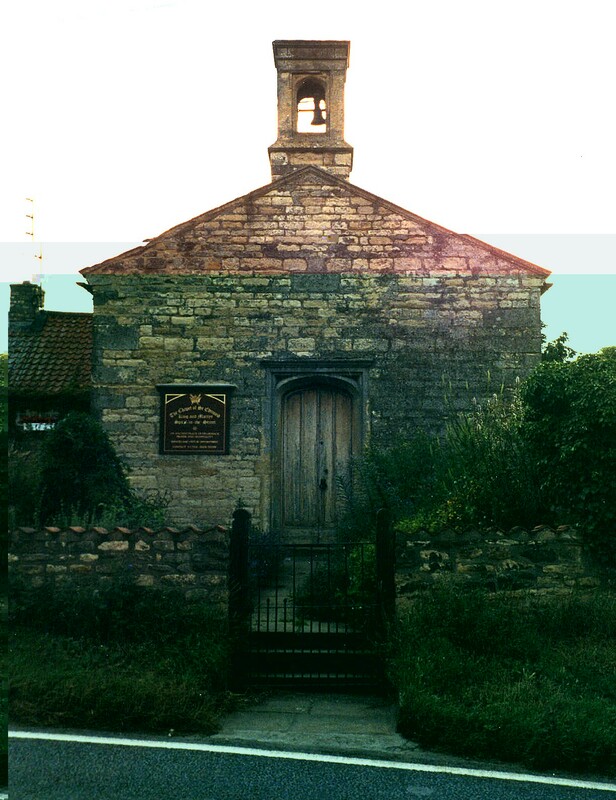 St. Edmund's chapel of ease, associated with All Saints, was established at Spital (see History). The original building was replaced in 1664. It was restored in 1890 and seats about 50 persons. 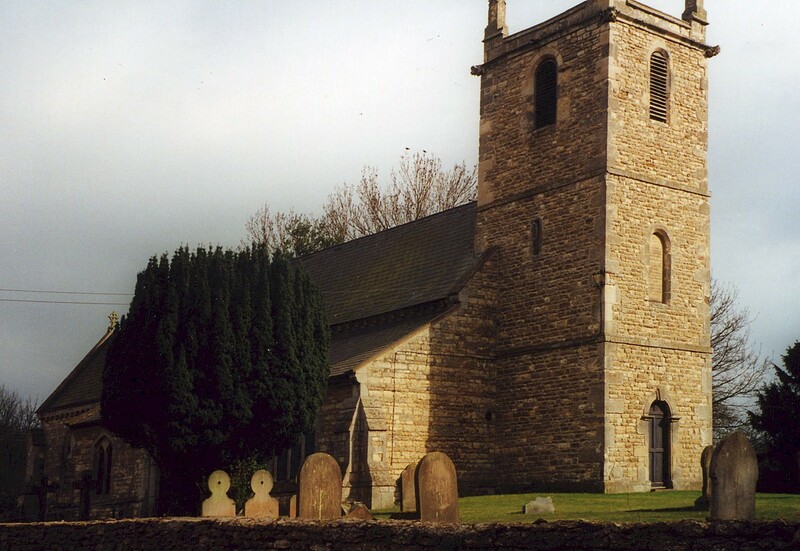 There is a photograph of All Saints Church on the Wendy PARKINSON web site. Richard CROFT has a photograph of All Saints' Cchurch on geo-graph, taken in January, 2006. Julian GUFFOGG has a photograph of the Church interior on geo-graph, taken in May, 2015. Parish registers exist from 1676, but the Bishop's transcripts go back to 1599. The North Lincolnshire Library holds a copy of the parish register entries for baptisms 1685-1885, burials 1684-1963 and marriages 1685-1836. We have a handful of entries extracted from the Helmswell parish register. Your additions are welcome. The stone font bears the arms of the MONSON family. The Wesleyan Methodists had a chapel here, as did the Primitive Methodists. The Wesleyans also established a school to educate 12 poor children of the parish. For more on these chapels and their records, check our Non-Conformist Church Records page for additional resources. Hemswell is both a parish and a village lying in a valley about 8 miles east of Gainsborough and 9 miles north of Lincoln. The parish itself is bordered on the north by Willoughton parish, to the west by Corringham parish and to the south by Harpwell parish. The parish covers about 2,660 acres. Hemswell has a chalybeate spring on the north-east side of the village, which gave its name to the whole parish. The village can be accessed off of the A631 trunk road east of Gainsborough. Turn north at the B1398 and go almost a mile and the village will be on your left. J. THOMAS has a photograph of the Village Hall on Geo-graph, taken in 2012. You should stop in and get a schedule of forth-coming events. If you are approaching from the west, keep an eye open for this Bench and village sign as photographed by Steve FAREHAM on Geo-graph, taken in September, 2015. The cemetery will be just to your right. Ask for a calculation of the distance from Hemswell to another place. You can see the administrative areas in which Hemswell has been placed at times in the past. Select one to see a link to a map of that particular area. The ancient Roman Road from Lincoln City to the Humber, Ermine Street, forms the eastern boundary of the parish and runs through the hamlet of Spital. A statue fair or hiring fair was held at Spital on each May Day. The Hospital, for which Spital is named, apparently had an ancient past, dating back to Edward II. A license was granted to John, son of Richard de VENDEUR, vicar of Thevelby, to endow John with land in Hemswell and Harpswell for the Hospital. But other sources say the hospital existed prior to the granting of the license, serving pilgrims and wayfarers. In 1396, Thomas de Aston made considerable additions to the hospital. The buildings decayed and the property passed through several hands, the funds were misappropriated and eventually the hospital was reduced to a chapel of ease. The chapel stands at the northern edge of the site formerly occupied by the hospital. Jonathan BILLINGER has a photograph of the Maypole on Geo-graph, taken in January, 2007. Richard CROFT also has a photograph of the Maypole on Geo-graph, taken in January, 2006. In 1841, the chief landowners in the parish were Sir Thomas WHICHCOTE and the Mayor and Corporation of Lincoln. In 1872, 1900 and 1913, the chief landowners in the parish were Sir George WHICHCOTE, baronet, and the Mayor and Corporation of Lincoln. From 1900 through 1913, the Manor house was occupied by a Mrs. CARTER. The Royal Flying Corps (RFC) opened an airfield here in World War One in late 1916. It was a night landing field and was called "RAF Harpswell". The field was closed in 1919 and returned to pasture. The RAF seized the land in 1935 and opened RAF Hemswell in January, 1937. Three different Polish squadrons flew from this airfield during WWII. The field closed for repaving in June, 1943. It re-opened in January, 1944. During World War II, 122 bomber aircraft from Hemswell were lost in combat operations. The last aircraft left Hemswell in 1956 and the base was converted to a Thor Missile unit. Much of the facility has been retained. You can see Photographs of buildings and museum aircraft. An outdoor display of the RAF in Lincolnshire was moved to Hemswell some years ago. The display is only open on Sundays. A memorial to RAF Lincolnshire is on Flickr, taken in 2012. There is a separate brass plaque to James BIRKITT (spelling is different than shown) as above. Plaque is topped by an engraving of the Lincoln Regiment "Sphinx" cap badge, with the word EGYPT inscribed beneath. In Loving memory of Arthur James Birkitt of the 3rd Lincolns Regt. the much loved son of J and A Birkitt who was killed in action in France 12th April 1917 in his 24th year. "He gave his life for his Country" - From one who held him in the greatest esteem. IN PROUD AND HONOURED MEMORY OF DOUGLAS JAMES POPPLE, FLIGHT SERGEANT R.A.F. WHO GAVE HIS LIFE ON ACTIVE SERVICE 24th JULY 1942 AGED 22 YEARS. They died that we might live. Erected by his fellow parishioners. Only Ernest REDHEAD is buried in the local churchyard. He was a private in the 10th Btn., Sherwood Foresters and died on 5 June 1917 at age 23, son of Henry and Eliza REDHEAD, of Glenthworth, LIN. The name Hemswell comes from the Old English Helm+wella for "spring or stream of a man called Helm". The name appears in the 1086 Domesday Book as Helmeswella. The name is recorded in some records as Elmswell. White's 1841 Directory lists the following names in the parish: BAINBOROUGH, BARR, BEAUMONT, BRUMBY, COUPLAND, DEWICK, HALL, HILL, HOLMES, KEYWORTH, LEIGHTON, MARSHALL, MARTIN, ROBINSON, RUSTON, SMITH, STORR, TAYLOR, THOMAS, TREVER, TURNER, TUXFORD and WINN. White's 1872 Directory lists the following surnames in the parish: ATKINSON, BAINBRIDGE, BARRATT, BEAUMONT, BRUMBY, CLIXBY, COOK, COUPLAND, HOLMES, KIRKBY, KITCHEN, LAMBETH, LOVE, MARSHALL, MILLS, OGLESBY, SMITH, TUXFORD, VICKERS, WALKER and WASS. Kelly's 1900 Directory lists the following names in the parish: Elizabeth BEAUMONT, Coggon BRUMBY, Mrs. CARTER, Thomas COOK, George COULSON, George COUPLAND, George CRUST, Charles H. HARS, Frank A. HOLMES, Eunice HORTON, Thomas LARRATT, Charles LOVE, Rev. Timothy G. LYNDE, ("brothers") MILLER, Alfred and John OGLESBY, John RUSTON, Miss SMITH, Mary SMITH, Harry G. THORPE, Wm. WALKER, Rev. Ernest W. VAUGHN and William WRAY. Kelly's 1913 Directory lists the following names in the parish: Elizabeth BEAUMONT, Coggon BRUMBY, Rev. Robert P. CARROLL, Mrs. CARTER, Charles COBB, George CRUST, Terah ELWOOD, Frank A. HOLMES, Rachel HORTON, Charles LOVE, Cedric H. MARSHALL, Fred and Harry MILLER, Alfred and John OGLESBY, Henry REDHEAD, John TATUM, Harvey G. THORPE and William WRAY. In 1908, who had the largest family? The southern part of the parish was in the Corringham Wapentake. You may contact the local Hemswell Parish Council regarding civic or political issues, but they are NOT staffed to help with family history lookups. The poor had the income of 20 shillings per year (1872) distributed to them from a charity left by Thomas CODD of Snarford in 1662. After the 1834 Poor Law Amendment Act reforms, the parish became part of the Gainsborough Poorlaw Union. There is a photograph of the Spital's almhouses at the Images of England website. This is a Grade II listed building with British Heritage. The Public Elementary School was erected in 1859 by Sir Thomas WHICHCOTE, baronet, and enlarged in 1879 to hold 100 children.